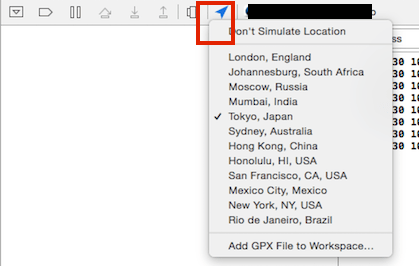 Using the Core Location framework properly and efficiently is a must for those developing iOS apps that make use of the user’s location. I am writing this post to cover some following typical challenges when using Core Location on iOS 8 to help others with similar issues. If you are upgrading from iOS 7 to iOS8, it may take you a few minutes (or even a few hours) to find out the reason why your code doesn’t work at all. You may discover that the locationManager:didChangeAuthorizationStatus, locationManager:didUpdateToLocation:newLocation fromLocation and locationManager:didUpdateLocations are not called at all. Why? Remember to provide a meaningful message describing the purpose of obtaining the user’s location; otherwise your app may be rejected when submitting to the App Store. Secondly, you have to call the requestAlwaysAuthorization or the requestWhenInUseAuthorization method prior to using location services. After modification, [locationManager startUpdateLocation] should work normally. But that’s not all. Next, we should carefully go through the list of changes in the release notes for Core Location to adjust our code to work perfectly with iOS8. It’s good practice! LocationManager returns the user’s location via the locationManager:didUpdateToLocation:fromLocation or locationManager:didUpdateLocations callback. You will sometimes wonder that why the callbacks get called many times, or why the first location obtained is usually quite “old”. CLLocationManager tries to provide you with a location as soon as possible so that you can process your logic without waiting for a few seconds. To do that, it caches location data from the last time you call [locationManager startUpdatingLocation]. Your app will then receive the simulated location and act as if this is the real location of the user, making it easy to test the app during development. However, what is worth mentioning is that, once the fake location has been set for the device, future apps that run on the same device will also receive the simulated location as the user’s current location, which is “Tokyo, Japan” as configured above, regardless of the actual location of the device. The real location is only reported again after the device has been rebooted or the app under development uninstalled. This seems to be a serious security risk on iOS 8. So, is there any way to detect this behavior and prevent it? To cater for this, I just work around for now by making at least 3 attempts to look up the user’s locations, and checking the lat/long/accuracy/speed/and course value to determine if it’s simulated or real location. This is just a temporary measure as Apple may change the behaviour in the future. Unfortunately, it still allows simulated locations even with the setting unchecked. This may be an xCode bug – let’s see if it will be fixed in future releases of the iOS SDK.